There are several vantage points from which to spy the existing Union Station facade through newly constructed skylights, window openings and the above around pavilions. This view from tracks 5 and 7. Details of Union Station Transit Center's offerings posted nearby the new transportation hub. An architectural rendering of the Union Station Transit Center is posted outside Denver's Union Station. Union Station was the home Friday for a day-long ceremonial opening, replete with everything you'd expect as Denver celebrated its future transit hub. The day was marked by a ribbon cutting, official speeches, music, games, and - of course - a beer garden. 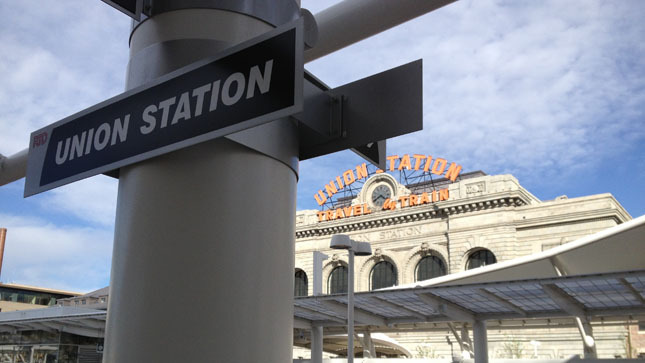 The design of Denver's new Union Station Transit Center shines light on the daily commute. An airy and colorful space, the $500 million transit center is an all-service transportation hub. It's home to the end of the line for the Mile High City's light rail lines, three current and four more set to come on line by 2018. The station also serves Amtrak, bus and free shuttle services. Commuter rail to Denver International Airport is also set to come online by 2016. The newly renovated Union Station connects to newly constructed platforms by a pedestrian bridge and a series of underground tunnels. The Union Station and Wewatta pavilions, two of three primary entrances to the new underground bus concourse, provide access between the street and the concourse. Two new smaller pavilions - platforms two and four - allow light rail commuters access to the bus terminals below. The city's affinity for public space extends here with a 30,000 square foot promenade on 17th Street. Wynkoop Plaza, set to open summer 2014, will add more green space and host outdoor concerts, festivals and holiday gatherings. Operation of The new 18th and 19th Street MetroRide, a free commuter shuttle begins May 12. It is expected to shave several minutes of the 16 block route that currently serves the 16th Street Mall. Union Station's "Great Hall," a 22,000 square foot multi-use space with a hotel, retail shops and restaurants, is set to open July 12.